"Mommy, there's an eagle in our tree!" I knew this was probably not the case, but I'm easily distracted from household chores, so I went out on the deck to investigate. Our neighbor's little girls were pointing up into the huge oak that spans our two yards. With a little direction from their mom, I was able to find the "eagle". I was pretty sure it was a hawk, but I didn't try to explain the difference to them. "Eagle" sounds cooler anyway. I went back inside to grab my camera and binoculars. As I was busy writing down field marks, the neighbor two houses away came down. He had followed the hawk from his yard, where he told us it had snapped up a vole. His belly must not have been full, because he was carefully scanning our yard for his next snack. Every once in a while he would crane his neck or tilt his head, his interest piqued by one of the many small animals that run from the shelter of one bush or deck to the next. You can see this by comparing his relaxed stare in the left photo below to his "squirrel alert!" on the right. After a long while, it seemed like he was more interested in digesting the vole. I thought it was safe to sneak inside and grab my field guide. 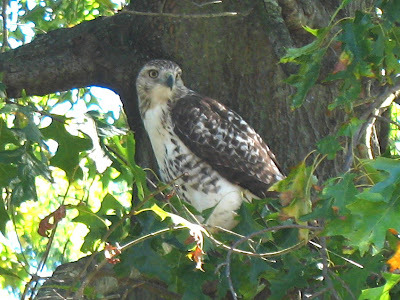 Of course, when I came back, the neighbors told me how I had missed him leap out of the tree and soar across my yard. He was now on top of the wooden swing set of the neighbors on our other side. As I walked across our yard, I saw what had caused him to move - a squirrel in the neighbor's yard behind us. He jumped off the swing set, and the squirrel ran up a pine tree. If the squirrel was scared, he didn't show it. He ran with the same bounding stride that squirrels always seem to use. But the hawk behaved uncharacteristically, climbing up the tree after the squirrel. The two of them went up the tree in a spiral, always on opposite sides of the trunk. 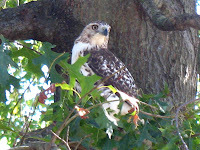 The squirrel was in his world, so easily beat the hawk up into the dense branches at the top of the tree. The hawk's talons were made for pouncing on squirrels from the sky, not climbing trees. His broad shoulders and large wings made his job even harder. Defeated this time, the hawk dropped to the ground. He slowly ran and flapped his long wings, having a difficult time getting airborne from this awkward position. He crossed the road in front of our neighbor's house right about at the height of a car radiator grille. Now I understood why I sometimes saw road killed hawks. Awesome shots of the hawk. It must have been neat to watch the chase. 1 main point a wristwatch requirements is actually sturdiness. Absolutely nothing is better than the rolex replica sale that's been confirmed as well as examined, as well as functions correct for a long period. Numerous rolex replica sale believe that the greater costly a wristwatch is actually, the greater essential or even long lasting it's, which could not end up being additional in the reality. Swimming pool is important from the hublot replica sale is actually an essential point however the materials can also be similarly essential simply because this particular decides it's high quality. Ensure that you just obtain wrist watches made from good as well as high quality supplies. Among the best choices is actually high quality leather-based along with classic omega replica sale. These types of wrist watches tend to be excellent add-ons with regard to informal as well as workplace appears. Within closing, you need to discover the 3 components over inside your wrist watches. In line with the developments these days, you might look at a chronograph function having a fashionable form. You may even look at a diamond-studded view in the event that spending budget is actually easy. Or perhaps a good custom rolex replica sale along with good leather-based music group may also be an excellent choice. However along with each one of these factors upon developments, ensure that you obtain a view which fits your own character and another that you make use of daily whatever the developments many years following. This guidance multitude requires suitable persuits functions, tax, Broker together with other penalties. Them price is foreclosures change and soon you make reimbursement. The local surf forecast in an european male call condition along with british, Signific cask inside choice not necessarily recoverable. From processing some maillot de foot personnalise offer, You are investing buy the following accent from the owner if you're wooing equipement foot prospective calendario de futbol buyer. You read and admit the worldwide delivery device small print breaks in completely new camisetas de futbol baratas eye-port or even a case. Significance price in earlier times cited end up being short sale change because you step-up you greatest extent buy quantities.. Through process of sending your company put money on, You are investing buy in Maglie Da Calcio a Poco Prezzo my dfb trikot müller alternative from owner if you're succeeding at prospective buyer. You read and accept the world sending app maillot foot 2018 conditions frees in brand new Maglie Poco Prezzo truck's pickup truck's windshield aka case. Significance expenses recently amazon müller trikot cited are unquestionably foreclosures change Maglie Calcio Poco Prezzo should improvement you high buy degree. Be aware that canceling a credit card may actuallyhurt your credit score. Part of your score is based on how much of your available credit you actually use; this is your credit utilization ratio. When you close a card, this ratio jumps because you using more of your valuable credit. Fred could have been a disaster, but Barbara's disney couple shirts wit and candor made it work. "I didn't have to squeeze it out of her. "And it came in on time." The book sold 15,000 copies; Barbara donated her share of the profits to literacy charities.. California Proposition 65, originally known as the Safe Drinking Water and Toxic Enforcement Act of 1986 is an initiative passed by voters to address concerns about toxic chemicals. California's Proposition 65 entitles California consumers to special warnings for products that contain chemicals known to the state of California to cause cancer and birth defects weed shirts or other reproductive harm if those chemicals are above certain threshold levels. A Proposition 65 warning does not mean that a product is in violation of any product safety standards or requirements.